In May of 1989, Sabbat returned to the stage after a live-performance hiatus of approximately twenty months, but it was with a significantly different lineup than the band’s prior incarnation. Their previous performance, in September of 1987, had taken place in time of grief, as Gezol’s (bass/vocals) and his brother Samm’s (drums) father had died accidentally earlier that summer. Much transpired during the ensuing period of mourning and transition. 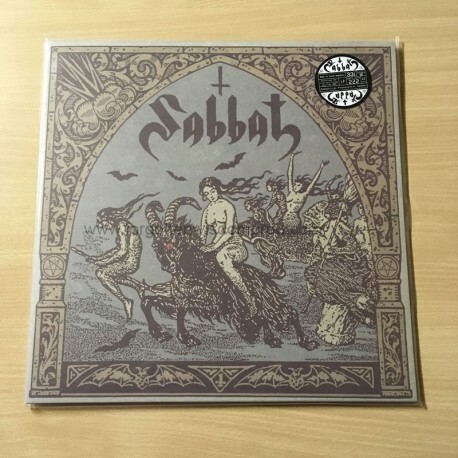 While Sabbat continued recording its infamous series of early 7” EPs in the studio, Samm branched out and began a new band by the name of Satanas with his friend Zorugelion. Shortly thereafter, Samm received an offer to join the Tokyo-based black/thrash outfit Sacrifice, and he gladly accepted. Meanwhile, Sabbat’s recordings had begun to garner attention, thus rekindling Gezol’s interest in renewing Sabbat as a live act. However, Samm had already left for Tokyo, and longtime guitarist Elizaveat was apparently no longer interested in playing live shows, which made such a reformation a difficult prospect. Fortunately, upon his departure, Samm recommended that in his absence Gezol enlist the services of Samm’s friend and former band mate Zorugelion to play drums inSabbat. Gezol offered, and Zorugelion accepted, which solved one piece of the lineup conundrum. In order to finalize the lineup, Gezol invited two additional members to join them. Thus, with their identities and monikers somewhat shrouded in mystery, Barraveat (guitar) and Possessed Hammer (vocals) joined Gezol (bass) and Zorugelion (drums) for a single live performance on May 2nd, 1989, at the invitation of Samurai zine.